We’ve known since last year that Wargroove was coming with a map editor, but we hadn’t seen it in this much action before now. Not only will you be able to create custom battle scenarios, you’ll be able to plot out entire Wargroove campaigns on a map, and even create your own interstitial cutscenes using an easy-to-use scene director that’s built right into the game. GameXplain runs through Wargroove’s custom toolset in the video below, and it’s remarkable how user-friendly they are. Everything is done right in the menu interface, and you can go from laying down roads and rivers on battle maps to plotting encounter locations in the campaign to blocking out cutscenes – complete with dialogue and weather effects – without taking your hands off the controller. Here’s the video. Take note of how many lovely map decals there are for the battle scenarios – I reckon players are going to have a field day creating lovingly-detailed battles and campaigns with this thing. It’s not clear exactly what “VERY soon” means, but this can only be good news, right? 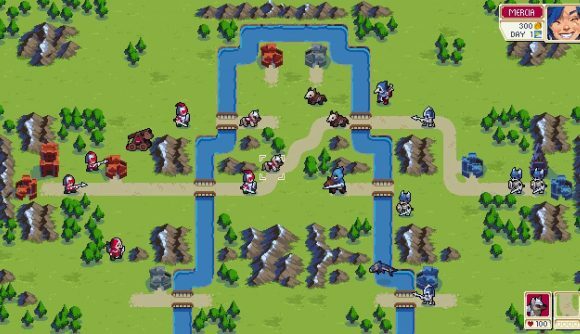 We’ll be keeping an eye on this one for sure – many of us have fond memories of playing Advance Wars on the Gameboy Advance, and that makes Wargroove one of the games we’re looking forward to most this year.